This delicious, cardamom flavoured ice cream is really easy to prepare and made light 'as a cloud' by the addition of crumbled meringue pieces. Place 100ml of the cream, the crushed cardamom pods and seeds and half of the lemon zest into a small saucepan over a low heat. Warm through for 2-3 minutes, until just about to simmer. Do not allow to boil. Remove from the heat and leave to cool completely. Whisk the remaining cream in a mixing bowl until only just starting to thicken, but not holding its shape. Strain the cardamom cream into the bowl and then add the custard. Fold everything together. Pour into a 1-2 litre freezer-proof container, cover and freeze for 1-2 hours, until starting to freeze. Use an electric whisk or fork to mix the ice cream until smooth, then return to the freezer again. Repeat twice more. After the last whisking, fold in the meringue pieces. Return to the freezer for at least 6 hours before serving. 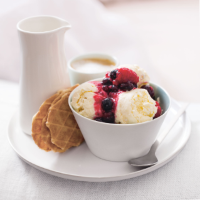 Remove the ice cream from the freezer 20 minutes before serving so that it is soft enough to scoop. Meanwhile put the berries, cranberry sauce, remaining lemon zest and 2 tbsp water in a small pan, cover and warm over a low heat for 10 minutes, until the berries soften but still hold their shape. Sweeten to taste with the sugar. Serve the warm sauce wit the ice cream and wafers or butter crisps on the side. This recipe was first published in March 2015.